What is Thermage TK Skin Marking Paper? Thermage CPT is a skin tightening device that is designed by Solta Medical, an American company that specializes in manufacturing energy-based medical devices. Unlike other skin rejuvenating procedures that may be invasive or involve surgeries, Thermage CPT therapies are completely noninvasive and non-ablative. The device generates collagen-stimulating continuous monopolar radiofrequency (RF) heat energy that is delivered with great precision to the skin via one of the Thermage Treatment Tips. The heat energy from these devices repair inelastic collagen fibers and regenerate stronger ones at the treatment area, making the treated skin looking tighter, radiant, and younger-looking. Thermage TK Skin Marking Paper is a temporary stencil that outlines the treatment region on the skin that requires heating. Following a successful Thermage CPT treatment session, the skin becomes smoother, tighter, and well-sculpted. Each box of Thermage TK Skin Marking Paper comes with six sets of the disposable skin marking paper sized 0.25cm2 or 3cm2. 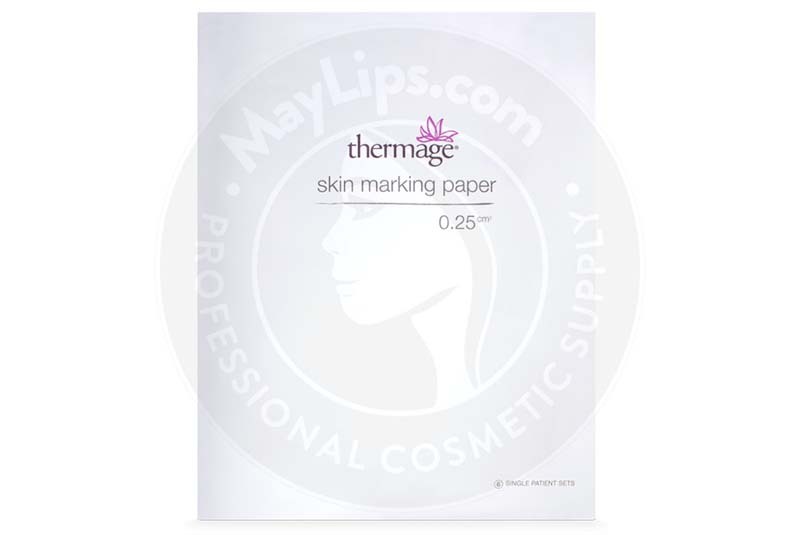 Thermage TK Skin Marking Paper is an accessory used in Thermage CPT treatments. 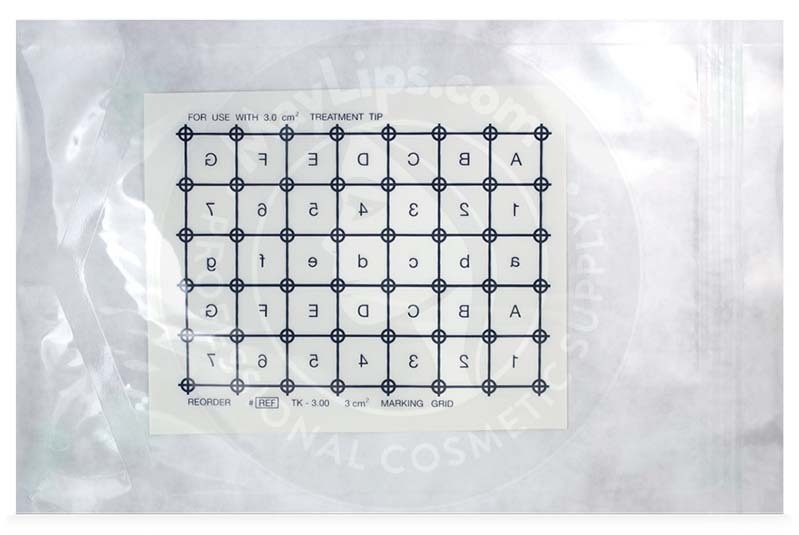 The stencil is made of temporary ink that is meant to be transferred onto the skin so that physicians can conduct the heating process of Thermage CPT treatments precisely and uniformly. Thermage CPT is a skin revitalising device that is incorporated with proprietary Comfort Pulse Technology (CPT), a unique energy algorithm that is similar to Transcutaneous Electrical Nerve Stimulation (TENS) therapy. This therapy is effective at reducing pain as it makes use of both hot and cold sensations to interfere with the activity of sensory nerve cells and disrupt the usual neural response. 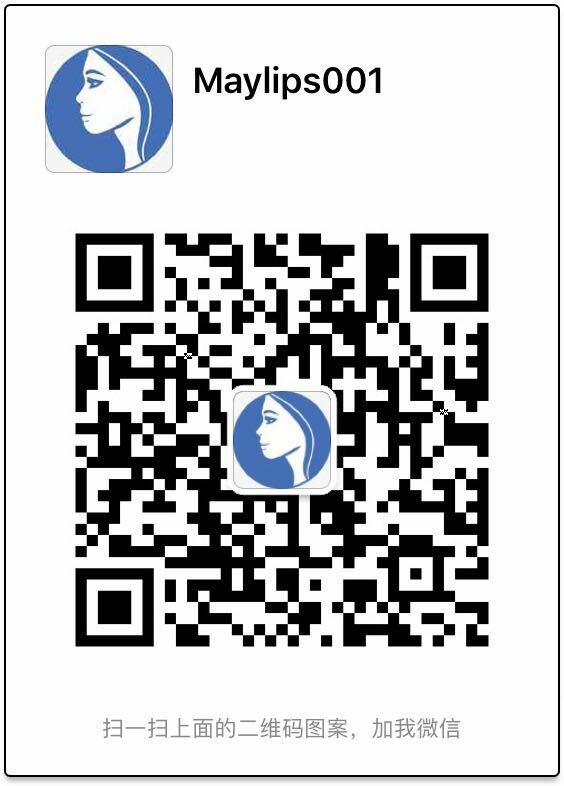 In addition to treating the skin using collagen-stimulating continuous monopolar RF heat energy, Thermage CPT also release bursts of a cooling effect before, during, and after the procedure to reduce the risk of epidermal burning and to soothe the skin. Most importantly, the device is also equipped with a vibrating setting that, when enabled, gently massages the skin to further suppress pain and discomfort. 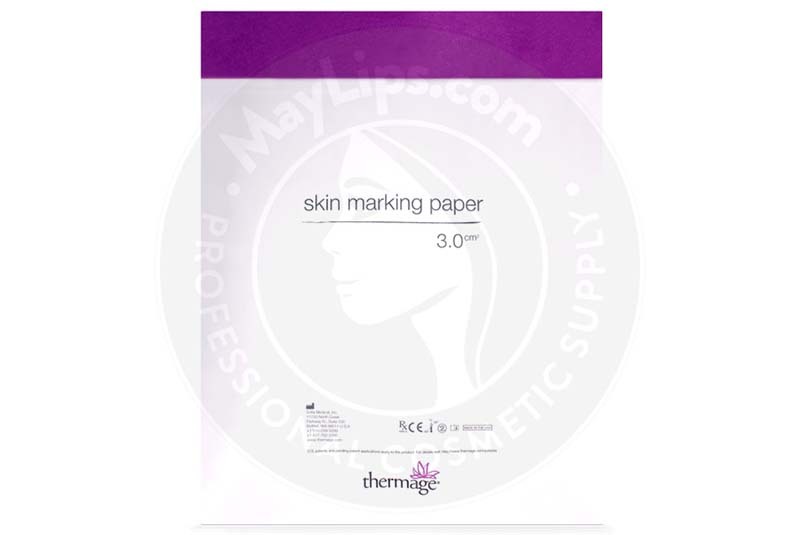 Thermage TK Skin Marking Paper is an important element of the therapy that functions to define the treatment zone uniformly so that the heating process can be done safely and effectively. 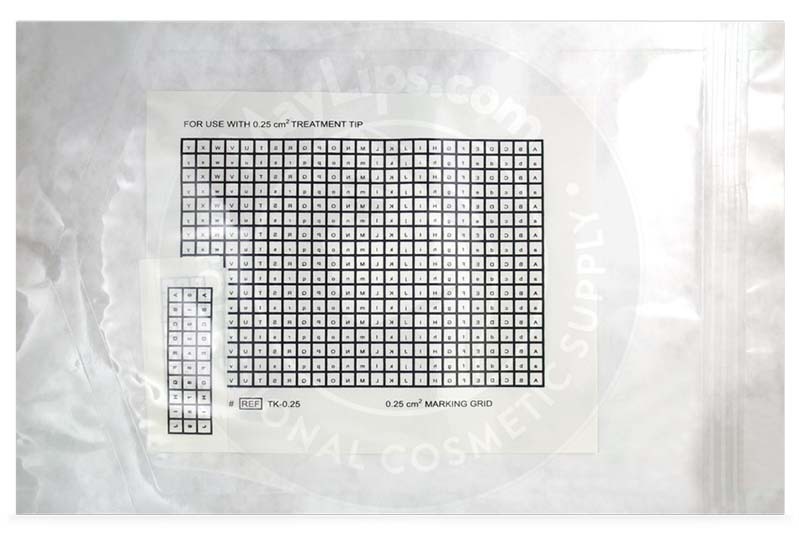 Each skin marking stencil can only be used once and must be discarded at the end of a treatment session together with other used medical supplies. Thermage CPT treatments must be performed by licensed and skilled aesthetic or medical practitioners; aseptic guidelines should be followed throughout the procedures. Before a patient can be treated, they must have their medical history thoroughly evaluated to determine their aptness to undergo treatment with a Thermage CPT device. A pre-procedural consultation session is also important to assess the severity of their skin problems and determine the appropriate treatment goals. Once the patient is deemed ready and their consent has been obtained, the physician can start a session by cleaning and sanitizing the treatment region and attaching the Return Pad on the patient’s back. Next, the physician should place Thermage TK Skin Marking Paper ink side down over on the moistened treatment region. They may use a gauze moistened with isopropyl alcohol to lightly dab the paper until the ink grid shows through it. Following application of Coupling Fluid, the physician should start the heating process until the pre-set number of RF heat energy pulses have been delivered. The duration of each Thermage CPT treatment session depends on the severity of the aesthetic imperfections faced by the patients. On average, a session can last for about 20 minutes to 2 hours. The aesthetic outcomes are usually evident at the end of the treatment session and should intensify over the next few months as the skin repairs itself from within. Most patients enjoy the skin beautifying effects of a Thermage treatment for at least two years before the original skin problems start appearing again. Patients with an active implant or an implanted electronic device like cardiac pacemakers. Patients with dermal reactions like infections, rashes, and inflammations on the proposed treatment region. Patients with underlying conditions that interfere with normal skin recovery process, such as autoimmune diseases and a history of radiation therapy. Patients who are active smokers. Following a Thermage treatment session, the treated area may appear red and swollen and painful to touch. These mild reactions are indicative of inflammation, which should subside within a couple of days. Proper postprocedural care methods, including keeping the treated area clean and applying healing ointments on regions with lesions, generally help to reduce the risk of infections and pus discharge. Other rare yet serious undesirable reactions that patients may experience include burns, scarring, and altered sensations. Medical practitioners must take the time to read through the package insert of the Thermage CPT device and Thermage TK Skin Marking for a detailed list of possible side effects, which they should explain to their patients; this allows for quick identification and swift corrective actions to be taken. Thermage CPT is a skin tightening and contouring device that is designed and manufactured by Solta Medical. It tightens lax skin and erases wrinkles by treating aged skin with continuous monopolar RF heat energy that restores and regenerates collagen fibers, resulting in well-contoured, smooth, and radiant-looking skin. Thermage TK Skin Marking Paper is a stencil made of temporary ink that helps to define the treatment zone prior to the procedure so that the skin can be heated uniformly.